I invented or came up with this myself. 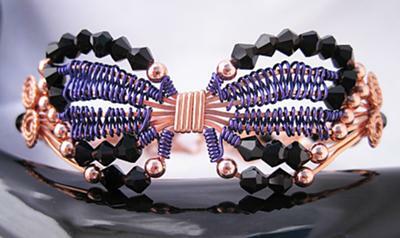 A Butterfly Bracelet made of square copper wire, purple aluminum wire weave, copper beads, black Swarovski bicone beads all made into the bracelet that I just love! This bracelet will fit a 7-1/2" wrist. This is wonderful!! So pretty! Would love to feature your work ! I adore butterflies and yours is wonderful ! I would like to see more of your work, if you are interested in being featured, please see my blog --- we are always looking for new and unique artist to share with the world ! Wow...what a beautiful design. Love the beadwork. That is very clever! Beautiful job! Beautiful! Excellent Craftmanship. I love the intricate detail. That is one fab bracelet. Love the colors.